This is a great light healthy dish and a nice light way of eating venison, beef can be substituted if you can’t get venison and adding other spring vegetables to the salad is a good idea. Wash the beetroots off then wrap in tin foil with a little sea salt. Unwrap and then peel the outside off, cut into wedges. Pan fry the venison all over to get the even colour then place in a 180’ oven for 2-3 minutes until cooked rare. Rest. Make the dressing by placing the red wine, sugar and the balsamic in a pan and reduce by half, then place in a bowl and whisk in an equal amount of olive oil and a little sea salt. 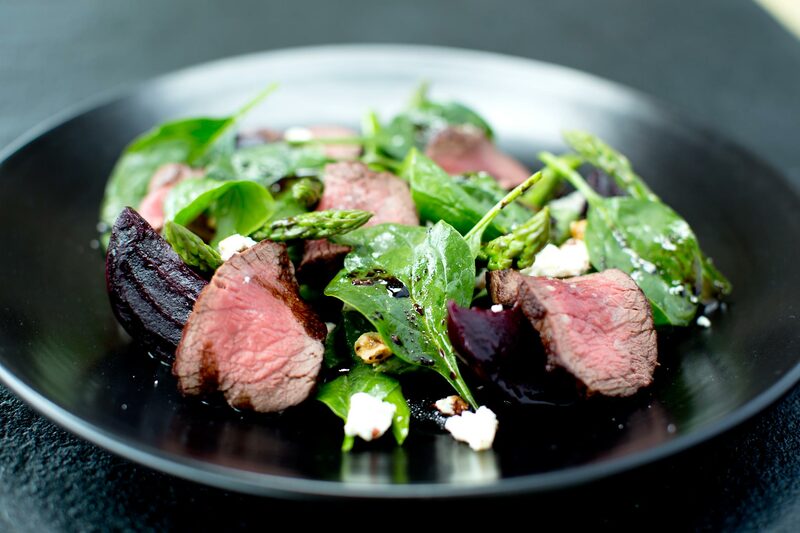 Lay the spinach, beetroot and asparagus on a plate then slice the venison and lay on top then finish with hazelnuts and dress with vinaigrette.